Since I arrived at UTS we’ve been researching and prototyping our way forward on writing analytics, in close collaboration with academics here, as part of our broader program to develop learning analytics for 21st century competencies/graduate attributes. We want to understand the potential of the (sometimes controversial) topic of providing students with automated feedback on their writing. Two pieces are forthcoming this year, which exemplify how we are tackling this exciting but complex challenge. The first is a pilot with Civil Law students using a parser tuned to analytical writing, and the second with Pharmacy students using a parser tuned to the very different qualities of reflective writing. Numerous other pilots are also underway, which we look forward to reporting in due course. Abstract: Reflective writing can provide a powerful way for students to integrate professional experience and academic learning. However, writing reflectively requires high quality actionable feedback, which is time-consuming to provide at scale. 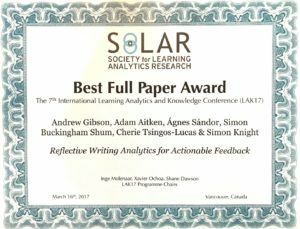 This paper reports progress on the design, implementation, and validation of a Reflective Writing Analytics platform to provide actionable feedback within a tertiary authentic assessment context. 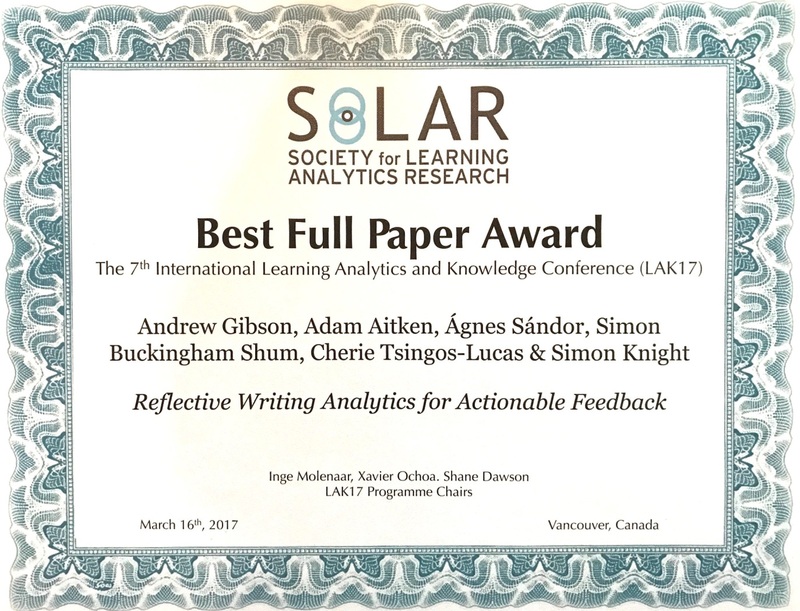 The contributions are: (1) a new conceptual framework for reflective writing; (2) a computational approach to modelling reflective writing, deriving analytics, and providing feedback; (3) the pedagogical and user experience rationale for platform design decisions; and (4) a pilot in a student learning context, with preliminary data on educator and student acceptance, and the extent to which we can evidence that the software provided actionable feedback for reflective writing.